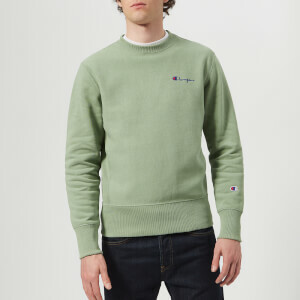 Men's crew neck sweatshirt from American heritage sportswear label, Champion. 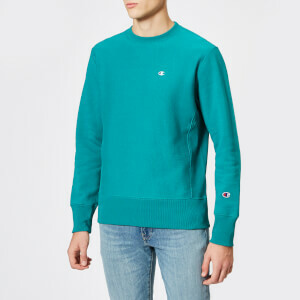 Crafted from a cotton blend using reverse weave technology, a technique that helps to prevent shrinkage, the teal sweater features a ribbed crew neck, ribbed panels to the waist and a small Champion logo to the chest in signature white and red. 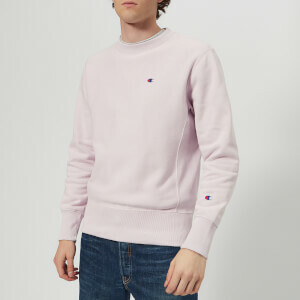 Designed with a casual aesthetic, the sweater is complete with ribbed trims and embroidered logo to the left cuff.